Superman rescues a Russian submarine in trouble under the Bering Strait, but rather than receiving thanks he’s sent packing by the commander. It seems the heavily lead-lined craft is hiding something. Meanwhile in Metropolis, it’s TV producer Lois Lane who’s sending someone packing – blogger Victor Barnes, who claims to have proof that Superman ‘walks among us’ in a secret identity. She finds the idea ridiculous. Across the city, a super-strong young woman robs a bank, claiming the trinket she takes from a safe deposit box is her property, locked up by her neglectful father. Outside the Daily Planet building, Victor sees his suspect in an alley, snaps a picture and takes it to Lois’ boss, Morgan Edge, who decides to run the story on one of his other stations. Clark, having been ordered by Lois to buy dinner for herself and sister Lucy as an apology for failing to give a lift to the latter, rushes away on hearing of the bank job. He’s soon tussling with the robber – who calls herself Anguish – and learns that she’s a tough nut … he can’t touch her, but boy, can she give him a good thumping. … ah, but that would be telling. Suffice to say that someone’s day gets unexpectedly interesting. This issue won’t break the internet. No one dies. No marriages are magicked away. Jimmy Olsen doesn’t come out of any closet, unless the underwater models he’s imagining are male. It’s great fun though! Superman is unambiguously heroic, using his powers to help wherever he can, and no one questions his integrity. He’s no genius – he can barely recall which is latitude and which is longitude – but he’s smart, and calm in a crisis. Lois and Jimmy are likable as they play against Silver Age type – Lois doesn’t believe Superman would have a secret ID, while Jimmy is incredulous when Barnes uses the phrase ‘scoop of the century’. There’s the mystery of the sub’s cargo and the question of Anguish’s family life (and awful choice of codename). We see that Lois cares enough about Clark to want Lucy to like him. There’s the return of post-Crisis Metropolis eatery Carlini’s (can Bibbo’s be far behind?). Heat vision, not laser. A definite S-curl at times. 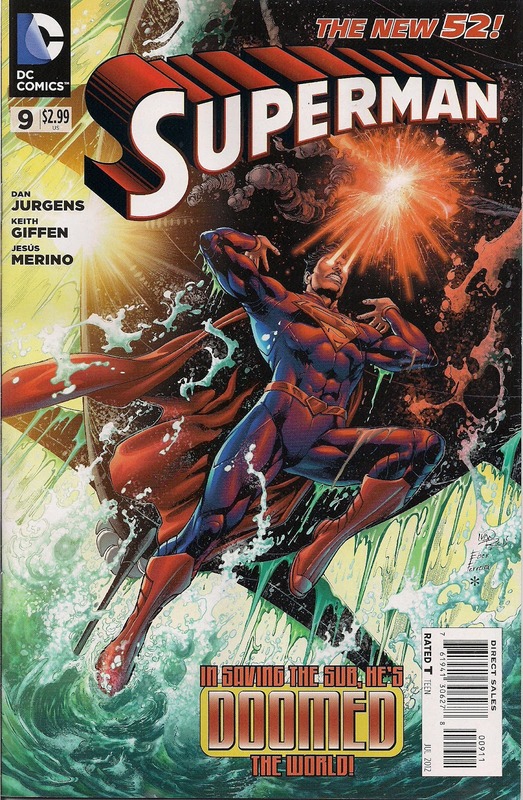 It’s all good in Keith Giffen’s script, co-plotted with penciller Dan Jurgens. These two comic vets have the energy and imagination of hungry whippersnappers, and I’ll be sorry to see them go in a few months. Jurgens’ storytelling, finished by Jesus Merino, is as strong as ever, powering the narrative forward. The colour artistry of Tanya and Richard Horie brings an extra dimension to the pages, whether it’s ripples on the sea, textured stone at the bank or a sound effect made transparent to match the phasing of Anguish. The cover by Ivan Reis, Eber Ferreira and Hi-Fi isn’t my favourite, with the composition not taking logo placement into account. And while the colouring is appropriate for the scene, it’s not great for impact on the stands. Then again, that submarine-covering logo is rendered in white and red, my number one combo for this classic piece of design. Forget the stupid armour, forget the spit curl ban (sssh, it’s in here), this New 52 Superman is simply classic Superman – the hero we need. All things considered, I'd call Anguish an improvement. I'd been intending to pick this one up, to check out the promised “turning point” for Lois Lane, but it completely slipped my mind. Glad to hear it's a good'n, though! Fascinating, thanks for that Rob. She reminds me of early Black Alice in that picture. Hi, I did see the film – loved it. I'm not planning on a review as it's so well covered elsewhere, and I'd wind up writing reams and boring everyone! Great review and great issue. I wish Perez would have stayed with the title but Jurgens and Giffen have done a solid job so far. This is honestly the first issue of this title post-reboot that I actually liked; I enjoy Perez in general but his storyline was DOA and if they wanted a fresh voice for the “New 52,” his was certainly an odd choice. Giffen/Jurgens aren't exactly spring chickens themselves, but after that clunky Helspont storyline this issue seems like them starting to hit a little bit of a groove. I guess Lobdell's next on the docket, and I would prefer a little more radical choice, but I'm interested to see what he does with this new iteration of Superman. There's a Blue Beetle film? It'll be interesting, at least, to see how Scott Lobdell treats Superman (if indeed he is the new writer). Who knows, it could be a thing of wonder. Hi Kerry, anyone in particular you'd like to see writing Superman?